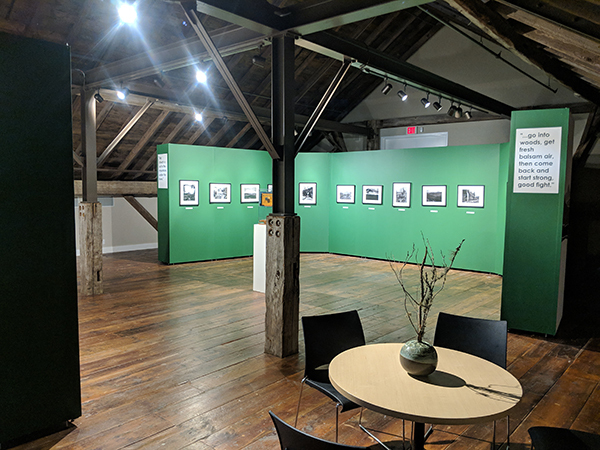 From March 9 - June 2, 2019 in the upstairs Loft Gallery, The Bascom has teamed with the Highlands Historical Society to showcase work by legendary photographer George Masa. George Masa was a photographer for the Vanderbilt, Grove, and Seely families, creating promotional materials for the area over 100 years ago. After seeing Masa's photographs, John D. Rockefeller, Jr. donated funds for lands that eventually became part of the Great Smoky Mountains National Park. This exhibition showcases fifteen selected photographs by Masa of the Highlands-Cashiers Plateau as well as current photos taken from the same locations by local photographer Claude Sullivan. An interactive map invites the public to go out and do the same, explore the places where Masa once trekked and take in the natural beauty that still surrounds the area. Participants can then shoot and submit their photos to The Bascom to be included in our Trail Level Education Gallery. The Bascom would like to thank our year-round exhibition sponsors: Bel Canto, Cathy and Bob Fisher, Delta Air Lines, Virginia and Mike Campbell, Chaparral Foundation, Bobbie and Jon Golden, Ginger Kennedy and Kevin Naylor.